Here's my 2nd design team sample for the new challenge over at Blockheads Paper Arts called Magic Metals! This time I created a faux embossed peacock feather embellishment for my card! It's technique challenge time again at Blockheads Paper Arts and Karen is hosting the challenge this month and she has an awesome tutorial and technique sample for you to check out over at Blockheads Paper Arts where you will find all the challenge details. Also check out my first project featuring faux gold embossed postage stamps! Here's my card I made using Blockheads' latest stamp set - Proud As A Peacock and a sentiment from the Verses full sheet. Stamp the Peacock feather background stamp onto blue cardstock with Top Boss Embossing ink and emboss with white embossing powder. Colour the centers of each feather and random sections of the wavy feathers with metallic markers. Tone down the whole background with a wash of Black Soot Distress Stain! I love how this changed the whole look of the background. You can't really tell in the photos but the metallic colours do still show through and you can see the subtle hints of metallic blue, green, copper, gold and pink! 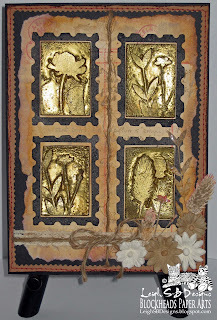 Cut out three narrow panels and distress the edges with Silver Mixatives Adirondack Alcohol Ink. Corner punch (Marvy) all three panels and adhere to mats cut from black cardstock with double sided tape. Ink up the small peacock feather from the Proud As A Peacock stamp set with Top Boss embossing ink and have it ready to use. Cut a piece of Tim's Grungeboard and apply clear Top Boss embossing ink to it. Sprinkle on a layer of regular metallic silver embossing powder. I used UTEE (ultra thick embossing enamel) in my first project and I wanted to demo that you can use regular EP too. Melt the first layer of EP with a heat gun and while the EP is still molten sprinkle on a second and then a third layer and continue heating. While the EP is still hot sprinkle on blue and green Patina Perfect Pearls powders. Continue heating until the Perfect Pearls melt into the EP for a really cool effect. While the EP is still in a liquid state press the stamp firmly down into the EP and try to avoid moving the stamp or wiggling it in any way! Hold it there for a few seconds to allow the EP to cool and harden and then carefully remove the stamp. The result is a beautiful embossed design but if you don't like how it turned out you can simply reheat the EP and start again! Cut a mat from black cardstock and use the same corner punch on it. Then adhere the faux embossed metal feather embellishment to the mat with white craft glue. Make a folded card from black cardstock with the back slightly wider than the front cover. Cut a mat for the card front from a sheet of green pearlized patterned cardstock - The Luxury Stack by DCWV. Adhere the three feather background panels to the green mat with double side tape. Wrap metallic variegated fiber around the panels a few times and adhere the ends on the back with a piece of tape. (In the photo the fiber colours look completely wrong for the card but I just couldn't capture the true colours properly without affecting the colours of the other card elements. In real life they're darker and look more like peacock feathers with a wonderful metallic shimmer to them.) 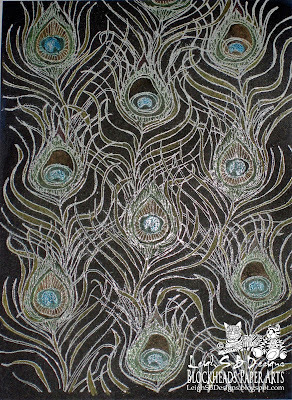 I decided to go with that particular fiber to bring out the subtle metallic colours of the feather background panels. Adhere the faux embossed metal embellishment to the card front with dabs of white craft glue. Then adhere everything to the black card with double sided tape. Stamp the sentiment onto a piece of black cardstock with Top Boss embossing ink and emboss with the same silver embossing powder. Cut a mat from the same green patterned cardstock and corner punch all four corners. Adhere the embossed sentiment to it with double sided tape. Punch small holes on both sides of the sentiment and add square silver brads. Adhere the sentiment panel to the inside of the card with double sided tape. 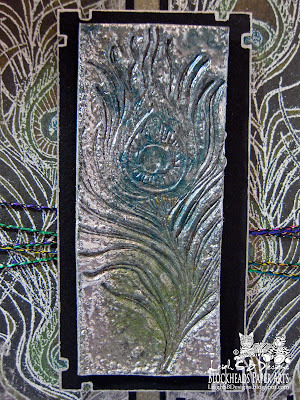 Distress the right hand edge of the card front with silver Mixatives Alcohol ink. Below you can see how the sentiment looks with the card open. I've given you two great ideas as well as Karen's Magic Metals tutorial to get you inspired so I hope you'll give this technique a whirl and enter the Blockheads Magic Metals Technique Challenge for a chance to win a $25 gift certificate! The Challenge closes on April 21st so you've got plenty of time to play and enter! All the info regarding the challenge is below with pics of more design team samples as well as the challenge entries above the inlinkz button! I hope to see your project featured there soon too!!! Here's some challenges for this card! Love,love,love how you added the Perfect Pearls to the last layer!! Another stellar Magic Metal card!! What an absolutely stunning project. I love the effect of stamping into hot EP to create those postage stamps. I haven't done that in quite awhile so thanks for reminding me about that technique! Your card is feast for the eyes with the beautiful hues and that terrific texture. We are so thrilled that you have joined in the fun of our first challenge. We hope you will be a regular at Frilly and Fancy! simply stunning. Looks soooo great. Leigh, the card is beautiful. I love it. Although you say the metalic fibre didn't come out the true colours, I don't think it deters from the beauty of your card one bit. I love the way you have used/designed the fibre on the card. It just gives it, that extra specical pazazz you always give to your creations.